Your source for daily news, LakePowellLife.com is our online news publication serving Northern Arizona and Southern Utah. With 80% of visitors now searching for local services on their mobile devices, our mobile-friendly website can be accessed for daily news, events, classifieds as well as visitor information. Our banner ads have high visibility. Call Janet at 928.645.8181 for a custom banner ad that reaches over 25,000 page views a month. We have several banner sizes and options for your needs and budget. Get listed in the PAGE BUSINESS DIRECTORY and reach some 2.5 million visitors a year searching for services in the Lake Powell area. Whether you have a website or not, you can get a dedicated business featured page on our site with three photographs and full information about your business. Save $60 on a basic listing when you sign up for a year! Contact Janet to get listed in the Page Business Directory. 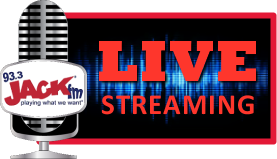 When you buy radio you reach thousands of listeners several times a day on two radio stations: KPGE AM & KXAZ FM. Our team of expert copywriters & on air talent ensures your advertising will motivate our listeners toward your products. Many of our clients use the Radio Stations to promote their goods & services to the traveling public. It’s hard to miss these Stations as you travel through town, as we are the only commercial stations (AM & FM) here in Page. We try to cross sell our products to the visitors, by putting the radio frequencies of the stations on the Front Cover of our VISITORS GUIDE Magazine, as well as Visitor Kiosks located in 7 strategic, high traffic locations around town. We are proud to serve Page and other Lake Powell communities. Locals targeting Locals is one of the specialties of these stations! Offering the only daily source for local news & weather information about Lake Powell, Kanab & the surrounding Communities, these stations have a large audience. Our community oriented FM signal is re-broadcast in Kanab Utah, and our new FM Tower gets the signal up-lake, as well as into Bryce Canyon. Our KPGE AM Country station has a vast signal area reaching across Northern Arizona to Utah and the Navajo Nation. This 24 Hour AM Station is the main “Country Music” station for the Western Agency of the Navajo Nation. No other AM signal serves the area, and there is no other Country Music Station here. KPGE enjoys CBS news hourly with local DJ talent sharing community events & information, and is the primary Sports station for families in the area. KXAZ FM is a “JackFM” Station with CBS News hourly. This 24 Hour FM Station serves the Navajo Nation, Lake Powell, Page Arizona & Kanab, Utah. We have 50,637 residents on the 70 mile radius & Page Arizona enjoys over 3 million overnight visitors to the Community. There are no other commercial signals originating in this community. The Station Covers the major routes to both rims of the Grand Canyon, the Grand Staircase Escalante, Bryce, Zion, Monument Valley Monuments and National Parks. The Sales Team at KPGE & KXAZ is dedicated to our customers. Our job is to increase the cash flow into your business, and we take that job very seriously! We have put together a group of products that targets the types of people you sell to. If your businesses are visitor driven, we offer you the premier magazine in the Area, the LAKE POWELL VISITOR GUIDE, published annually in the spring of the year. 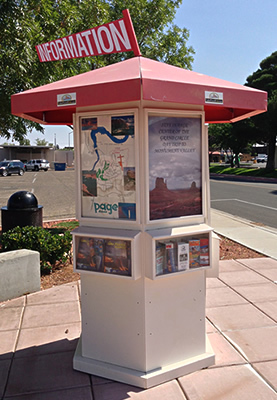 Our Visitors Guide and client brochures receive great distribution in our 7 outdoor Information Kiosks. 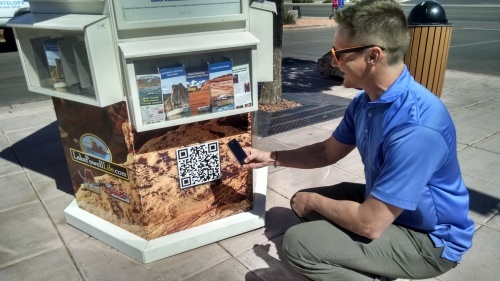 These Visitor Information Kiosks are open 24 hours per day, 7 days per week to sell YOUR message to visitors browsing at bus stops, popular restaurants, the airport, and markets. The Page Business Directory reaches over 25,000 viewers per month from all over the world. 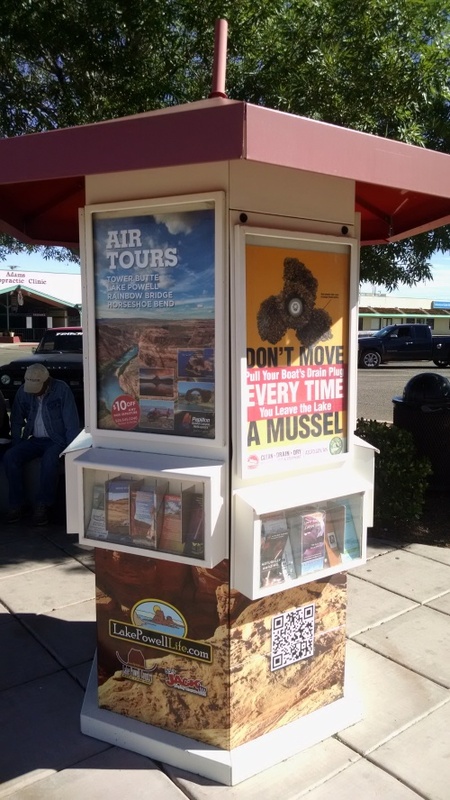 Capture the attention of 2.5 million visitors who come to the Lake Powell area. Our site is mobile-friendly for 97% of the population who are searching for services from their mobile devices. Get listed in the Page Business Directory now. It's fast. It's easy to use. For rates and information about advertising or web services, please call 928-645-8181. Ask for Janet, or send an email to janet@kxaz.com.